Reproduced with kind permission of the Hermitage. Francis Bacon sits in a complex place in the history of modern art. This isn’t surprising: as a profoundly complex man it is most certainly the place he would have chosen. His work doesn’t fit logically into mainstream histories of modern art, the histories that give preeminence to stylistic trends, logical progressions, or holistic theories. There was no ‘ism’ that contained and gave meaning to Bacon’s oeuvre. He was a representational artist in the age of abstraction. But as one of the greatest painters of his century, he was deeply Modern in his sensibilities—more interested in modernity than Modernism perhaps—and revealed this in his approach to paint and in his sense of what art was for. His art was about the maelstrom-like nature of life, the traumas of isolation, love, and personal identity, and as such, he struggled with the human issues of his age. He also felt intensely close to his painter forebears, the grand masters who had gone before him, and he endlessly made use of them in the search for his own language. Velázquez, Rembrandt, Michelangelo, Ingres, Van Gogh and many others fed his creativity, firing him into transformatory action. Like Picasso, he was an eclectic Modernist, who took what he needed from the art of the past to make the art of the present. That is what this exhibition is about: the use of the past by one of the greatest modern painters: the past re-interpreted into the psychologically tense, frenetic world of a man searching for meaning at the boundary-edges of life. The exhibition also has another theme in its background. From early in his career, Bacon enjoyed the patronage and friendship of one of Britain’s greatest collecting and philanthropic couples, Sir Robert and Lady Lisa Sainsbury. The great collection of Bacon’s work at the Sainsbury Centre for Visual Arts, the institution Robert and Lisa built, is a direct result of this friendship, and a significant proportion of the Tate’s Bacons are there because of them. Many of these works are in the exhibition. 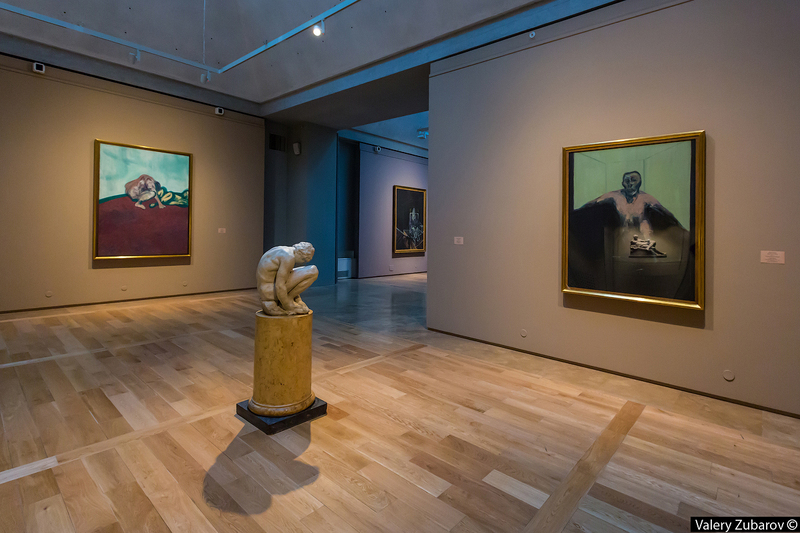 So the exhibition not only explores Bacon’s love and use of earlier great art, it also illustrates the work of two of modern Britain’s most generous and sensitive supporters of the arts. Finally, the exhibition inaugurates a relationship between the State Hermitage Museum and the Sainsbury Centre for Visual Arts, that will result in the two institutions staging scholarly projects and exhibitions well into the future. Cultural and intellectual exchange have always been the greatest means of fostering international understanding and friendship. We are grateful to our Russian friends and colleagues for taking part in this grand collaboration, for making the idea become a reality.